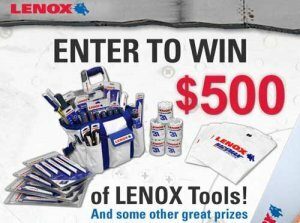 Lenox is giving away $500 worth of Lenox tools as well as some prizes for the runners up. All you have to do to enter is follow LenoxTools on twitter (and you should already be following ToolRank) or add them on Facebook. Very Simple. Good Luck.